I am trying to use a VB.NET AJAX Timer control within a Repeater. I cannot figure out how to get this to work. The timer needs to constantly check the server to see what time it is and then display a live countdown clock based on a given time. I have the code that does this and works successfully outside of the repeater. Just can't figure out how to do a separate timer for each item within the repeater. bstl, tks for the response. Can you please provide simple sample code for what you are describing? I do currently have updatepanel within my repeater that works properly. What I don't know how to do is reference the timer control from within the repeater. Or rather, reference the items within the repeater from the Timer_tick event that fires outside of the repeater. I have been trying to figure this out for weeks and no one seems to have an answer. Let me make sure I understand what you want. You have a server side repeater which is rendering similar items to your page. Then what you want to do is update said items on independent intervals and draw something else, right? So if it was rows you were rendering, it would be row 5 updates itself every 30 seconds with the latest data or something like that. Is that correct? I've attached a screenshot of my page. 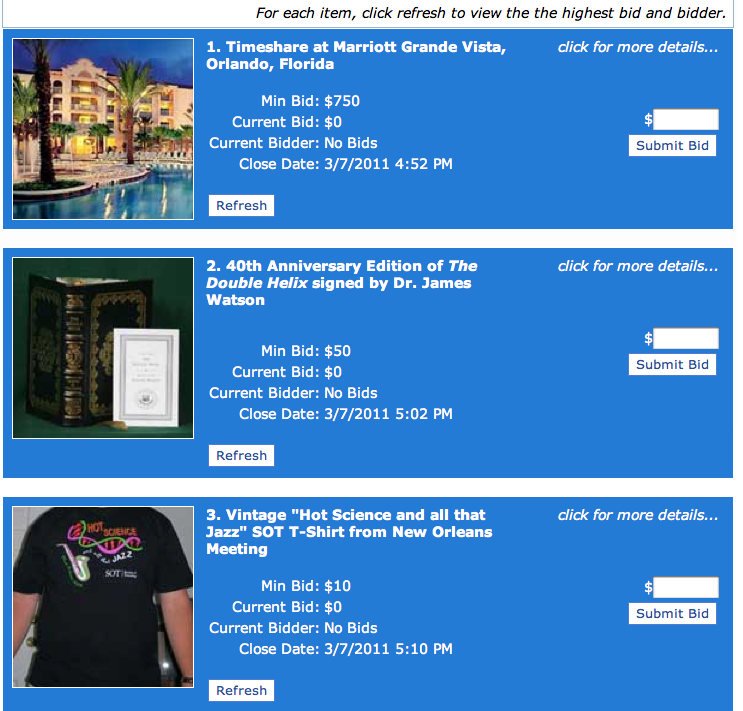 It's a online auction that each item has a close date. I need a timer that will display a countdown for each item showing time left until auction close date. Yeah, I've googled that too. Wasn't able to find a solution that worked within the .NET repeater. I don't understand, what is that blog for? yeah, just don't know how to reference the repeater controls since it's a dynamic amount of rows with dynamically assigned names. if you think you have the know how to make this happen, i'd be happy to pay you and resolve this off board. Edited 8 Years Ago by Ezzaral: Snipped email. Please keep it on site.